This paradise in Panama’s Gulf of Chiriqui crams more biodiversity into 50 square miles than almost any other place on the planet. Even today, the island remains unspoiled; its use as a penal colony from 1919 to 2004 had an insignificant impact on the environment. Aside from a small area allocated to cultivate food for the prisoners, the island was left undisturbed and undeveloped. Twenty years ago, conservationists and government officials in Panama took action to provide Coiba with the lasting protection it deserved. Its 1992 designation as a national park provided researchers greater unimpeded access and a greater ability to study Coiba’s wildlife and ecology. In July 2005, UNESCO declared Coiba National Park a World Heritage Site. Central to Coiba’s natural and historical character is its isolation from the mainland, which dates back thousands of years. Coiba Island separated from the Panamanian mainland somewhere between 12,000 and 18,000 years ago as a result of rising sea levels. Over time, mainland plants and animals evolved on remote Isla Coiba. Life forms on the island eventually came to exhibit a host of divergent characteristics that rendered them completely new species, different from their continental counterparts. The choice to locate a penal colony on Coiba made the island off-limits to the general populace for the better part of a century. Not that anybody really wanted to go there. Rumors of extreme brutality in the prison sufficed to scare away anyone interested in visiting the island. The fear engendered by the colony worked to discourage development on Coiba in the years before it was afforded official protection by the government. Even before the 2004 closing of the penal colony, Isla Coiba enjoyed national park status, and the UNESCO designation further solidified the island’s future as a well-preserved natural area. Coiba’s underwater topography links it to Costa Rica’s Cocos Island and the Galapagos Islands via a submarine mountain chain. The surrounding waters abound in marine life. In May of 2011, a new coral species was discovered in this area. Who knows how many unknown species wait for a careful observer to discover them? Encircled by one of the largest coral reefs on the Pacific coast of the Americas, this bustling aquatic scene gains in color and character thanks to the Indo-Pacific current which travels through the Gulf of Chiriqui, bringing with it a number of migratory species. The variety you’ll find in this section of the American Pacific Ocean mimics the Caribbean Sea. Humpback whales, sharks, whale sharks, orcas and some big-name big game fish either visit or inhabit these waters, to the delight of snorkelers, scuba divers, and sportfishing enthusiasts. Life flows uninterrupted on Coiba. Its location protects it from the effects of El Niño and La Niña. The island acts as a refuge and storehouse for wildlife, as well as an evolution laboratory designed by Mother Nature herself. You know old Charles Darwin would have given his opposable thumbs for a chance to study biology on Coiba. Unlike the Galapagos Islands (where Darwin famously hatched his ideas about natural selection), Coiba remains lightly-visited. To visit Coiba requires a special permit, no exceptions. 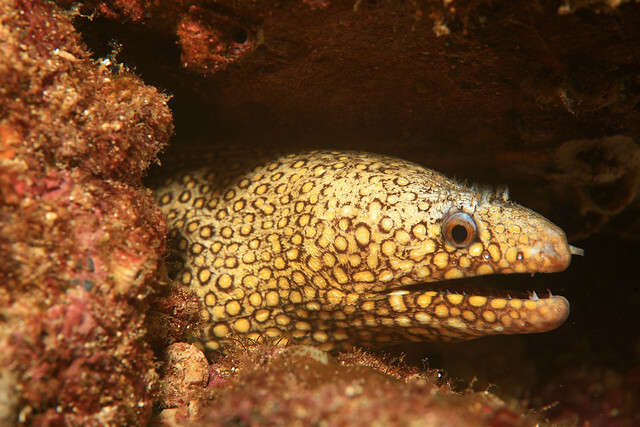 Researchers from the Smithsonian facility on Isla Coibita as well as from the headquarters for Coiba National Park (ministered by Panama’s environmental authority, ANAM) continue to conduct in-depth investigations of the island’s marine life. They classify coral, tunicates, sponges, bacteria and fungi found in the park’s waters. Their studies spawn new understandings of naturally-occurring chemicals and potential applications for these substances. Cancer treatments may, in years to come, utilize Veraguamide, an anti-cancer compound named for the Panamanian province of Veraguas located on the mainland opposite Coiba Island. Or Coibamide A: a compound named after Coiba, yielded by Cyanobacteria, and found to be extremely active against cancer cells. You may rely on Santacruzmate, an anti-parasitic compound named after the island of Santa Cruz, someday down the line when you forget not to drink the water. But Coiba Island and its larger home in the Gulf of Chiriqui have long been certified as a cure for the mundane. Here, the thrill of discovery still exists, even in a mapped-out and satellite-imaged world. I had no idea that so many undiscovered species still existed, much less in the same Gulf. Planning my trip to Gulf of Chiriqui to go diving. [post_content] => Home of the Coiba agouti, the Coiba spinetail, the Coiba mantled howler monkey, and four species of turtle you won’t find anywhere else… this island makes animals completely its own. Something about Coiba Island spurs the evolution of distinctive traits. Scientists working for the Smithsonian Tropical Research Institute (STRI) have identified a number of uniquely-adapted creatures on Coiba, prompting them to proclaim the island “an unparalleled destination for discovering new species.” Smithsonian project coordinator Rachel Collin says, "It's hard to imagine, while snorkeling around a tropical island that's so close to the United States, that half the animals you see are unknown to science." This paradise in Panama’s Gulf of Chiriqui crams more biodiversity into 50 square miles than almost any other place on the planet. Even today, the island remains unspoiled; its use as a penal colony from 1919 to 2004 had an insignificant impact on the environment. Aside from a small area allocated to cultivate food for the prisoners, the island was left undisturbed and undeveloped. Twenty years ago, conservationists and government officials in Panama took action to provide Coiba with the lasting protection it deserved. Its 1992 designation as a national park provided researchers greater unimpeded access and a greater ability to study Coiba’s wildlife and ecology. In July 2005, UNESCO declared Coiba National Park a World Heritage Site. The choice to locate a penal colony on Coiba made the island off-limits to the general populace for the better part of a century. Not that anybody really wanted to go there. Rumors of extreme brutality in the prison sufficed to scare away anyone interested in visiting the island. The fear engendered by the colony worked to discourage development on Coiba in the years before it was afforded official protection by the government. Even before the 2004 closing of the penal colony, Isla Coiba enjoyed national park status, and the UNESCO designation further solidified the island’s future as a well-preserved natural area. Coiba's underwater topography links it to Costa Rica’s Cocos Island and the Galapagos Islands via a submarine mountain chain. The surrounding waters abound in marine life. In May of 2011, a new coral species was discovered in this area. Who knows how many unknown species wait for a careful observer to discover them? Encircled by one of the largest coral reefs on the Pacific coast of the Americas, this bustling aquatic scene gains in color and character thanks to the Indo-Pacific current which travels through the Gulf of Chiriqui, bringing with it a number of migratory species. The variety you’ll find in this section of the American Pacific Ocean mimics the Caribbean Sea. Humpback whales, sharks, whale sharks, orcas and some big-name big game fish either visit or inhabit these waters, to the delight of snorkelers, scuba divers, and sportfishing enthusiasts. Researchers from the Smithsonian facility on Isla Coibita as well as from the headquarters  for Coiba National Park (ministered by Panama's environmental authority, ANAM) continue to conduct in-depth investigations of the island’s marine life. They classify coral, tunicates, sponges, bacteria and fungi found in the park’s waters. Their studies spawn new understandings of naturally-occurring chemicals and potential applications for these substances. Cancer treatments may, in years to come, utilize Veraguamide, an anti-cancer compound named for the Panamanian province of Veraguas located on the mainland opposite Coiba Island. Or Coibamide A: a compound named after Coiba, yielded by Cyanobacteria, and found to be extremely active against cancer cells. You may rely on Santacruzmate, an anti-parasitic compound named after the island of Santa Cruz, someday down the line when you forget not to drink the water. But Coiba Island and its larger home in the Gulf of Chiriqui have long been certified as a cure for the mundane. Here, the thrill of discovery still exists, even in a mapped-out and satellite-imaged world.